A Gift Card with a returnable voucher to claim one of our Mistletoe Grow-Kits. Why not give a romantic present that grows kisses! Ideal for Christmas or for Valentine’s Day! Available in a choice of five designs. A full description of the cards and designs is given below – scroll on down for full information. April 2019 update: Please note that whilst Gift Cards can still be ordered and delivered we will not be despatching actual Grow-Kits until February/March 2020. Our Grow-Kit Gift Cards are an ideal gift, particularly at Christmas or for Valentine’s Day. 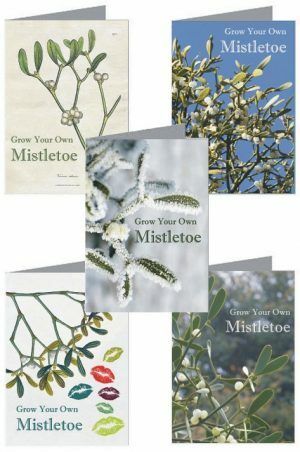 Each contains a voucher redeemable for one of our Mistletoe Grow-Kits, which are delivered in early spring. Gift Cards cost £16.50 inclusive of UK shipping. Shipping: We are shipping Gift Cards, Books and Postcards within two working days of order. We have a choice of five different Gift Card designs – Blue Sky, Frosty, Botanical, Mistletoe & Kisses and Leaves & Berries. You can choose yours from the drop-down menu above. Our Grow-Kit Gift Cards can be despatched at any time and are particularly popular for Christmas and for Valentine’s Day. Your card is delivered to you, for you to personalise and give, or send, to the recipient. Each card is complete with an envelope for you to send it to the recipient, a return pre-paid envelope and a voucher for them to complete with their name and address, before sending back to us. We will send their Grow-Kit (see full details about Grow-Kits here) to them in spring* – they can choose a despatch period that suits them when they return their voucher. Each kit contains 50 freshly-picked berries, enough for about 10 plantings, with detailed instructions, labelling material and a recording form to keep track of each plant. For full details read the description on our Grow-Kit page. 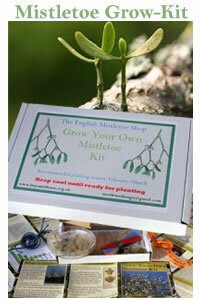 Please contact us before ordering if a Gift Card or the recipient’s Grow-Kit is to be sent outside the UK. Please note that Grow-kits cannot be sent outside the European Union. Please choose your Gift Card Design from the drop-down option at the top of this page and then click on ‘Add to Basket’. If you would prefer a Grow Kit without a card have a look at the options on our Grow Kit page.